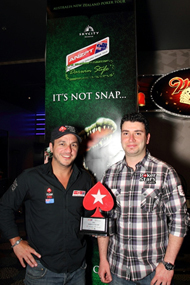 Australia's Tony Hachem (pictured left), achieved one of the great feats in Australian poker history. He has for the second year running won the ANZPT Player of the Year 2010. Tony began the season strongly when he finished 7th at the ANZPT Adelaide. He followed this up with his first victory in the ANZPT at Perth’s Burswood Casino. After cashing in ANZPT Sydney his place seemed secure, Tony had incredibly cashed in seven of the first eight ANZPT tournaments. This was before an amazing run from John Maklouf. John final tabled Sydney he then came second in Canberra and 8th in Queenstown, a remarkable three consecutive final tables. At Jupiter's Casino in the Gold Coast John over took Tony for Player of the Year when he made it into the points. It was not until the final event of the year that Tony was able to reclaim his title when he made the money and points finishing tenth. Before ANZPT Darwin started there were six players who could finish as Player of the Year and the first and second place was separated by just 1.15 points. Amazingly John Maklouf and Andrew Scarf were eliminated on Day 2 on separate tables almost simultaneously. This left the door open for Tony Hachem and Aaron Benton who were still in the tournament. Aaron Benton put in a valiant effort but could only manage 15th which meant he was unable to affect the Player of the Year standings.